Anglers should do what they can, including cleaning their boats and equipment after any and all fishing trips, to protect against the spread of the invasive New Zealand mudsnail. In 2015, the Michigan departments of Environmental Quality and Natural Resources confirmed the presence of the invasive New Zealand mudsnail in the Pere Marquette River near Baldwin, which is a popular destination for trout and salmon anglers. New Zealand mudsnails are each only about 1/8 inch long and can be difficult to see. 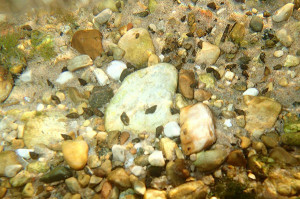 However, these snails can significantly change the aquatic habitats they live in by reaching extremely high densities. When that happens, they can out-compete native species that are important food sources for trout. They also have no nutritional value for trout species that may feed upon them, which can negatively affect the overall condition of the trout. The threat of New Zealand mudsnail spreading to new waters is high because they are easily transported via recreational users, such as anglers, due to their ability to attach to fishing equipment, wading gear and other hard surfaces. Once attached, they can hitch a ride to a new river or lake and begin the invasive process again. Additionally, a single snail can reproduce once transported. New Zealand mudsnails are very resilient and have been known to survive in damp environments for up to 26 days. As the spring fishing season gears up, anglers are anxiously awaiting the opportunity to target steelhead on the Pere Marquette and other popular Michigan rivers. It is important for anglers to clean, drain and dry their equipment to help prevent the spread of these invasive snails, as well as all types of aquatic invasive species. Anglers are encouraged to clean boats and equipment (including waders) with hot water or a diluted bleach solution, and, when possible, allow the equipment to dry for at least five days before reusing. Additional information about the New Zealand mudsnail and other aquatic invasive species can be found at michigan.gov/invasives.